The trouble is, I’m often not asked this question. Often, I see dental practices spending a truckload of money on external marketing, in an effort to attract new patients to come to that practice. And every dental practice needs a healthy stream of new patients coming to it. This is because in a good dental practice, existing patients of the practice will basically have healthy mouths that are absent of pathology. And so, existing patients will only provide the dental practice with “emergency” restorative opportunities when something fails, or breaks. New patients will always present with a multitude of conditions that need treating. i.e. the new patients will have more dentistry to perform to bring their mouths to optimal health. I say that a healthy dental practice needs only one new patient per dentist per day to maintain stability. This means that a dentist working 180 days per year requires fifteen new patients per month to maintain the economic and financial health of that dental practice. And fifteen new patients per month is roughly one new patient per day for a dentist working four days per week. If you are attracting and seeing more than 15 new patients per month to your dental practice, then your practice should be experiencing some significant growth, because a large number of those new patients will stay and become regular patients of the practice….. if they indeed want to. If your dental practice is seeing more than 15 new patients each month, and your practice is not growing, then you need to take a good hard look at your internals, including your systems, as well as your internal marketing. Because if you are doing things correctly, these new patients that you see and treat should be so enamoured by your good looks and charm that they should be beating a path to your door to become regular patients of record in your dental office. Good [and great] internal marketing and systems help to retain new patients as patients of record. Poor internal marketing processes will burn these new patients so badly that they will choose not to return for any treatment recommended to them. Poor internal marketing systems will also burn away existing patients of record as well. And because the cost of implementing great internal systems is minuscule compared to the price involved in acquiring new patients for that first visit, wouldn’t it make sense to have some basic internal principles in place to decrease the financial burden of attracting a large number of new patients into your dental practice, only to see them leave quickly? Yet despite this logical scenario, the vast majority of dentists out there throw bucket loads of money at new patient marketing, when all they need to be doing is fixing their internal processes, so that their patients actually stick around longer and remain patients of record. 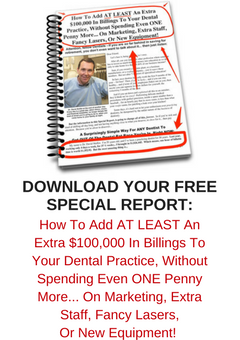 It does seem wasteful throwing more and more money at marketing to attract new patients to visit your dental practice with its lousy internals that drive these people away as quickly as you can attract them. It makes a lot more sense to be fixing those leaks and cracks, before paying for, and importing more new patients. External marketing will keep your dental office “out there” in front of the community for those occasions when it is time for people to find a dentist, or a “new” dentist. But it will be your internal processes that will keep those people as long-term raving fans, instead of them being “one-off” visitors to your dental office.